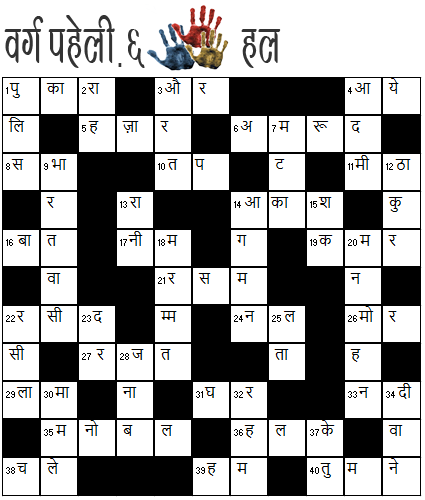 We are back as promised to share the solution of Hindi Cryptic Crossword 6 and announce our winner. One of the many delights for us, while reading your responses, has been hearing from first-time solvers. Do dig into our archives and try the older Hindi puzzles too - and we hope to bring more such in future! A few notable annos that we enjoyed reading: 3a - the observation that women are considered more civilized, so they can be called तहज़ीब की शुरुआत (with the ? to address any counters to this assertion); 3d - ऊपर से could indicate “taking the top off” of the word just above it (3a). The parsing of 18d tripped up many solvers, and we can see why in retrospect. It uses a not-too-common device – the stuttering clue – for a complex consonant in an unchecked cell. If the stuttering was not mentioned in the solver’s parsing but the rest of it was fine, we took it as OK.
For 20d, we accepted both double definition and triple definition in the annotation. 14d, 25d received special commendation for their surfaces – glad you enjoyed those clues! …those of you who cracked the puzzle fully. Did you spot the Nina? In keeping with Nina tradition, we did not call out its presence when we posted the puzzle. The lack of flagging, plus this Nina's non-linear arrangement in the grid, meant that it was easy to miss. And yet, two of our brilliant solvers spotted it – bravo Lakshmi Vaidyanathan and Arvind Ramaswamy! Well done Vasant Srinivasan, hearty congratulations! An Amazon gift voucher of INR 1000 will be on its way to you soon. Congratulations too to all the other 17 solvers who completed the crossword, and a big thank you to everyone who attempted it. Hope you had fun! Congratulations, Vasant! Thanks to all participants for solving! Hope you enjoyed the puzzle. The post announcing the contest had just one comment. Quite a coincidence that the person who posted that comment is the winner in a random draw! Thoroughly enjoyed solving the puzzle. Had got the Nina but forgot to highlight in the submitted grid. Thanks Kishore & Shuchi. Hope to see more Hindi Puzzles here. I shared the puzzle with my friends & colleagues here hoping some would take to solving. A few did try but they were unable to complete. Thanks, Vasant, for spreading the word. Congratulations to Vasant and all the other participants! Usha you can also solve the previous 5 puzzles, the links of which are given above.